Katerina Paliou as Medea, translated by G. Theodoridis. Performed at the Great Hall of Bibliotheca Alexandrina, Alexandria, Egypt. Night. In the background, in heavy shadows, the house of Jason and Medea, in Corinth. Jason and Medea’s house is clearly seen in the background. Two doors, one near the centre, the other, a smaller, to Stage Left. Medea uses the door in the centre, Nurse and Tutor the smaller one. Enter the Nurse. Tired. She has spent a sleepless night. She shakes her head in despair. Oh, how I wish! How I wish! How I wish that the fast ship, Argo had not made it past those cursed clashing rocks on its way to Colchis! Old woman, you are the servant of my mistress, why are you standing out here, in front of the gates, all alone, wailing the pains of your soul? Old man, you are the tutor of Jason’s children and you should know that what worries a mistress worries her servants –if they are good servants! So the poor woman hasn’t stopped crying yet? She’s such a foolish woman -if I may be allowed to use such words about my mistress- and she still knows nothing of her new troubles yet! New troubles? What new troubles? What is it old man? Don’t keep it from me! Nothing… No… Nevermind. I’ve changed my mind about telling you. I shouldn’t. Come, old man! By your grey beard, I beg you! We are both servants in the same household. Don’t keep anything from me. And don’t worry about me: I can keep my mouth sealed, if I have to. Creon will be banishing from Corinth, the old man said. I’ve no idea if this rumour is true or not. I sure hope it isn’t. But what about Jason? Would he let this happen to his children? Let them go into exile just because he has a quarrel going on with his wife? New loves erase the old ones, old woman. Well then, we are finished, old man! But you, woman, since it’s not yet time for our mistress to know, you say nothing to her. Keep your mouth shut! Oh? And who is a better father in this world? They’re all the same, old woman. I could see this a long time ago. The cloud of grief raising the heat of anger high, ever higher as this cloud broadens its cover. Oh, Gods! Gods help us all! I’ve heard her wails! The heavy groans of grief coming from the heart of this unfortunate daughter of Colchis. I see her pain still hasn’t eased. I’ve heard her agony from my room at the court. I don’t like the pain that now wrecks this house. Only my own heart knows how dearly I love this house. Can you not hear the wailing of this lamentable maiden? Poor girl! Why the pain? Why this awful pain for a lost bed? Such a pain will soon take you to your grave. Why? Why ask for death? Why ask for such a thing? So what if your husband has found another woman? Zeus will grant you justice, Medea! Don’t tear yourself apart, Medea, mourning a husband who won’t return to your arms. Did you hear that? Did you hear what words she finds to utter and how she calls for Themis? Themis, daughter of Zeus who understands oaths and Zeus who guards them? I wish I could go and see her, speak with her, make a little easier this weighty anger of hers, soften this awful torture which has taken over her heart. Such a wish to help friends should always exist. Hurry! Before she does something awful to her children. That dreadful grief of hers seems to deepen by the minute! She raised her voice, the poor wretch, with curses against the deceiver of her bed, cursing him that he should find his new marriage to be a black one. And she calls on Themis, Zeus’ daughter, to witness her suffering. It was she, Themis, protector of oaths, who, one night, guided her, through the endless salty sea here, to Greece, away from her own land, Colchis. Corinthian women. I have come out among you so that you’ll stop talking behind my back, condemning my every action. Corinthian women, you know that I have to suffer an insufferable thing, a thing that has worn my soul away. I’m no longer alive! And if all these things work out well and our husband lives with us without thinking the marriage yoke to be too heavy, well that would indeed be a great life. If not, though, only Death opens his arms for us. Only Death awaits us. From you, however I ask only one thing: If I manage to find some means by which I can punish my husband and his father-in-law, that man who gave him his daughter as wife, I ask of you to say nothing to anyone. Keep it a secret. A woman is, in all things, timid, shy, weak and can’t even so much as look at iron sharpened for war but when she’s deceived by her husband, when her marriage is mocked, there is nothing more murderous than her. Of course, Medea. Do as you please. It’ll be a justified act to extract vengeance from your husband. It is no surprise to us that you lament your fate. Ah, here’s our king, Creon. He must have some new proclamation for us. Ah! Now I’m truly lost! Poor woman. My enemies have used everything at their disposal to get rid of me. There’s nothing left for me to do to escape my fate. Oh, Creon! Creon! This is not the first time that my reputation has hurt me enormously. The words you utter can tame a man but I’m afraid –my heart is afraid- that your mind is spinning some evil web. I no longer trust you as I did before. You’re too silent now and whilst it is easy to protect oneself from a hot-headed man or woman, it is impossible to do so when the woman is scheming and silent. You’re wasting your words. I will not change my mind. So you’ll send me off into exile without the slightest respect to my prayers? Yes. My love for my family is far greater than my love for you. Oh how I miss you, now, Colchis! Yes and I too, love my own country second only to my family. Oh! What a dreadful thing love is! O, Zeus! May he who has caused all this suffering not escape his punishment! Leave now, you terrible woman! Leave and torture me no more! The torture, Creon, is mine! No, Creon, don’t do this! I beg you with all my heart! Woman, I can see, you’re up to no good! You’re persistently begging me about something! What is it then? Leave, I tell you! My request, king, is that you let me stay one day longer to prepare for my trip and to do what’s necessary for the children since their father does not care for them in the slightest! Have pity on them, Creon. You, too are a father and surely you’ll sympathise. I no longer care about leaving. My concern is only about the children. Of all the things you must suffer! What will you do now? Where is there a friendly family for you, what house, what place will you find to give you a haven from your terrible fate? What an inescapable tempest the gods have thrown you into, Medea! There are many ways of doing this deed. Many. But, let me see… which would be the best? Set fire to the wedding room? Or quietly enter it with a sharp blade and plunge it between their ribs? Well, then! Make use of all your wisdom, Medea! Make use of all the knowledge you possess about magic and about sacred crafts. Leave nothing out. Think and find schemes. Go forward with your terrible deed. This is the hour which you should show the might of your heart. Your suffering is before you. You can see it clearly. You must not become the subject of mockery by the scattered seed of Sisyphos and Jason’s new wife; you, the grand-daughter of the immortal Helios, the sungod. The order of things has changed. The holy waters of the rivers flow upwards. Justice and all things human turn backwards. Men’s thoughts are evil now and their belief in the gods is gone. And I can see that the coming stories will turn women’s reputation to that of a glorious and honourable gender. Their name will not longer be foul. Old poets will stop singing our faithlessness, taking advantage of the fact that Phoebos Apollo has not blessed us with the sacred gift of poetry. And you, Medea, you left your family home with a frenzied heart, passed through the sea’s giant twin rocks, to come and live here in a foreign land. They’ve taken your wedding bed away and then, dishonoured and fate-stricken, they’ve sent you into exile. Gone is the respect for the sacred oath and there’s no shame left within Greece. Shame has flown to the sky. You have no homeland to give you solace or protection from your suffering and your house and your husband are now used by another queen, a queen far more powerful than you. Still and all, here I am, with my love for you intact, to make sure that you and the children don’t leave this land lacking money or anything else. Exile carries enough hardship as it is. Hateful, miserable man! Words defy my tongue to put together insults worthy enough of your sort of cowardice! You dare come here, to us! You! You, a man most hated by all the generations of mortals and immortals alike – and by me! Ha! I need to be a very capable sailor to escape the tempest of your words, woman. I’d need to be excellent at the wheel as well as at the sails to slide past the whirlwind of your words. As for my marriage to the princess about which you disparage me, I will prove to you that I have begun this affair, not only as a wise and well-tempered man but also in the way that a good friend and a good father would behave. When I arrived here, from Iolcos, I was full of suffering and totally lost as to what I should do next. But I was lucky. I came across this marriage and I took the opportunity. What better escape was there than to marry this young Princes? The king’s very own daughter? But then again, that’s how you women are! When the duties of the wedding bed are maintained, all is well –you’re fully satisfied. But when something goes wrong with that bed, everything – good things, beautiful things and things of use are turned into hateful things! An eloquently speech, Jason. Nevertheless, my own heart says that you should not have betrayed your wife. My views differ to those of many folk. What I believe, for example is the more eloquent the misfit, the greater the punishment he deserves because, thinking that his eloquence and his pretty words will get him out of any injustice, he has the audacity to commit even greater evils. No, that’s not what bothered you Jason! That’s not it at all! What, in fact bothered you was that you would be entering your old age still married to a foreigner. I’ve told you before and I’m telling you again now. I have not married into royalty out of love. I did so because I wanted to save you and to give to my children royal siblings, from the same blood, siblings who will protect our household. I hope I’m never given such prosperity by means of such bitterness and such wealth by means of such a sad soul. One day, Medea you’ll think differently and you’ll act more wisely. Let not joy ever appear to you as something bad and happiness as something unhappy. You mock me. You make fun of me because you have a place to stand on, a house, whereas I, I, on the other hand, will be thrown out of here, alone and desolate. Accuse no one else, woman. You’re the cause of your own fate. Why is that? Is it perhaps because I have married and betrayed my husband? No, but because you’ve uttered sacrilegious curses to the royal family. True. Yes, it’s true. And I did so not only to them but to your own household as well. Ha! I’m not interested in what you have to say now. Just tell me if you want some money before you and the children leave. I’d be quite happy to provide you with plenty of that and with plenty of referrals to my friends. They will do everything in their power to help you. Reject the offer and you’ll prove yourself to be a fool; accept it, calm your anger and your benefits will be many. I need neither your money nor your friends. Gifts from an evil man are of no use at all to anyone. Fine! But remember I, on my part, have the gods as my witness. They know that I am ready to provide you and the children with anything you need. You, on the other hand, reject all the good things offered to you and arrogantly send away those who want to help you. For this, you’ll suffer even worse. When Aphrodite arrives in the hearts of people, with no fuss and with no exaggerated madness, she is a very enjoyable visitor but, alas, overwhelming lust brings neither honour nor glory to any one. I hope that wisdom, the most treasured gift the gods have given us, protects me from that misfortune! And, Lady Aphrodite, don’t plant into my heart improper love and then send me all the curses that go with it: Hatred, jealousy, endless fights. Instead, dear Lady, protect marriage and grant honour to all the peace-loving couples. How I love my land and my home! No one came to console you, Medea. In your worst hour neither your city nor any of your friends stood by you. I know this, not through some airy rumour but because I saw it with my own eyes. Yet you have suffered the greatest misfortune. I hope the man who does not honour his friends, the man who does not open an honest heart to them, I hope that man dies a horrible, a miserable death. Such a man will certainly never be a friend of mine! A joyful day to you, Medea. I give you the best greeting anyone can give to his friends. And a joyful day to you, too, Aigeas, son of wise Pandion. Where have you come from? From the ancient temple of Apollo. Why go to that oracle in the centre of the Earth? I needed to ask the oracle what I need to do to have children. Heavens! Are you still without children? Unfortunately, yes, Medea. Some god must despise us. But how is that possible? Are you not married? No, I am married, Medea. I have a wife with whom I share a wedding bed. Well then, what did Apollo say to you about having children? The god uttered words that are too wise for mortals like me to understand. May I ask what those words were? Of course Medea but one needs a very wise mind to understand those words. Tell me the words, Aigeas –that is, if you don’t mind, of course. And you musn’t do that before what? Before you reach what country? The oracle said not to do that before I return to my own homeland. And what is it that has brought you here? Someone by the name of Pitheus is the king of Troizen. Quite true. He is the son of Pelops. A very respectable man, from all accounts. I’d like to tell him the oracle, in case he can give me some understanding of it. Very possible because the man is a very wise one and one most experienced in such matters. Yes, not only that but he’s also a great friend of mine. I hope you’ll always be happy and that you succeed in your endeavours. But… Medea, why are your eyes so sad, your face so pale? What? What do you mean, Medea? Tell me what the problem is! Jason has been unfaithful to me, even though I did nothing wrong to him. He has married another woman who will now be the mistress in my own house. What? He dared do such a despicable thing? Not only that but now he won’t even turn to look at those whom he once loved. But… what made him do that? Lust. He is not the sort who’s born to be faithful to those he loves. Well, forget him then, Medea! Suddenly he wanted to be related to the royal family! So what king would have him as a son-in-law? Tell me everything. Ah, in that case your sadness is truly justified, Medea. I’m absolutely devastated and still, not only that but I’m also banished from this land! Who banished you, Medea? That’s another awful thing to endure! Creon! He is the one who has banished me from Corinth. But does Jason allow this? His mouth says he doesn’t but secretly, his heart hopes it happens. May the gods grant you all of your wishes. May you have children and may your death be a happy end to a long and contented life. Of course I’ll will help you, most readily and I shall do so for a couple of reasons. One is for the sake of the gods and another is because you have promised me children, a thing which I desire most deeply. So, if you come to my land, I’ll try to protect you because I am a just man. However, let me tell you, Medea, let me tell you right now that I’m not willing to take you from here, with me. If you want to come to my place, by all means, do so and I will protect you and grant you all due hospitality. But I, personally, cannot not deliver you to anyone. So, you must leave here on your own, Medea because I do not want to be held responsible for your disappearance, particularly by my friends. I shall do that but if you were to reassure me with an oath then I’ll have all I need. Don’t you believe me, Medea, or is there something holding you back? Of course I believe you, Aigeas but Pelias’ family and Creon are my enemies now, so if you’ve sworn an oath, you’d be constrained by that oath, if they come to you and try to take me by force. You would be tied by that oath. But if you just give me your word, without oath to the gods, perhaps their ambassadors might be able to convince you with diplomacy and you might become their friends. I’m a weak creature, you see, Aigeas whereas they are wealthy kings. I see quite some foresight in your words, Medea and since you wish it, I shall do so. It will provide me with some safety as well because I’ll have a strong reason to give to your enemies for not surrendering you up to them. Both of us will gain safety by this oath. Swear by Earth and by Helios, my grandfather, as well as the whole generation of gods. But what should I swear for? What must I do and what must I refrain from doing? Swear that, for as long as you live, you will not exile me from your land, nor surrender me to my enemies, if they ever ask for me. I swear by the Earth and by the bright light of Helios that I shall do all those things you just said. Good enough. But if you break your oath, what then? I shall suffer what all mortals who disrespect the gods suffer. Well, then, dear friend, go in peace and happiness. All will be well and I shall come to your city as soon as I have accomplished my wishes here. And may Hermes, son of Maia, protector of the traveller, guard your journey, Aigeas and may all your wishes come true. You seem like a kind and generous man. Thank you, Zeus and you goddess of Justice! Thank you, too, Light of Helios! But let me stop talking about that. Quite the opposite! I am most friendly to my friends and most fearsome to my enemies. It’s only people like me who live a life of glory. How could you even think you could kill your own children, woman? I could because this deed, more than all others will hurt him –my husband!- the most! You will be the most hurt woman on earth! The air in which, it is told, the golden crested Harmonia gave birth to the nine Pierian Muses. Where, it is also told, Cypris Aphrodite, drew water from the cool founts of the bejewelled Kifissos and mingled it with the sweet breath of the soft airs of fields and mountains. There, where she adorns her hair with the sweet rose-scented garlands and, they also say, she sends Eros off to sit by the side of Wisdom, to be her aid for ever and in every virtue. Think, woman, think how you will plunge your knife into the bodies of your own children! Think, woman think of the size of the crime which your hand will commit! Medea! We kneel before you and we beg you! We beg you by every possible means! Don’t kill your children! From where will your heart and your hand draw the dreadful courage to do this deed? How will you turn your eyes towards your children before you kill them, without being flooded with tears? No! No, Medea! You will not endure it. You will not endure their knee-delivered pleas to you, you will not endure painting your hand with their blood. Your heart will not endure it, Medea! I’ve come because you’ve sent for me and even though you hate me, your wish will still be granted. Jason, please, I beg you, forgive me for all the things I’ve said to you before. I thought all this out and then decided that both, my anger and my thinking, were totally wrong. Now, I praise you and your wise actions in uniting our families and realise that I was unwise in not immediately agreeing with you and helping you with your plan. I should have been there, during your wedding ceremony, standing next to your wedding bed, joyfully tending to your bride who loves you. My eyes, too, are bursting with heart-felt tears. Let’s hope the horror ends here. I applaud you, for your words my lady and I hold no ill feeling towards you for your past actions. Anger is a natural thing for women when their husband is planning other marriages. But, I see that your heart has turned towards other, more worthy sentiments and, at the end, you have realised which is the better decision. This is how wise women act. No, it’s not that. I’m overwhelmed with thoughts about the children. Courage, woman! I shall do all I can for them. Of course. I know you will. I have no doubt about that but women, you see, are weak creatures and their eyes are constantly full of tears. But why? What’s the reason for your tears? I’ll certainly try but I don’t know if I’ll succeed in persuading him. Then talk to your wife, Jason. Ask her to beg her father to let our boys stay. That’s a better idea. I’m sure I’ll be able to manage that. Yes, if she’s like the rest of us women, I’m sure you will manage that. But I’ll also help you with this, Jason. I’ll send the children to her with gifts, the sort that women love: a finely woven gown and a crown made of gold. You’re such a silly woman, Medea! Please, don’t interfere, Jason. They say that even the gods are persuaded more by gifts and gold than by a million words. She is the one blessed with luck now. She is young and she reigns – the gods are with her. I, on the other hand, am pleading for my children to stay here; and for that, I’d even give my life and more, let alone gold. There’s no hope now left for the children’s life. None! They’re heading for their own death. Our poor Princess! She’ll accept the golden gifts and with them, with her own hands, she’ll put them on her blond head. Gifts from Hades! The beauty of these gifts will enchant her and she will put on the beautiful gown and the golden crown and so, she will become Hades’ bride. This is the trap, the deadly fate she’ll fall into, the poor wretch. And you, you, ill-fated Jason, your marriage will be your dire fortune. You’ve become the son-in-law of kings without knowing that you’ve sent your wife and children to a gruesome death! Unfortunate man! You have no idea of what dire Fate awaits you. Still, I sigh at your pain, too, poor Medea! You will kill your own children because your husband has betrayed you and because he has left you for another woman. Madam, the children are safe. Here they are. They won’t need to leave the country and the Princess joyfully received the gifts with her own hands. You need not worry about them any more, madam. Madam, what is it? What made you so afraid? I have brought you good news! Why turn your face? Why not receive these news with joy? This behaviour is not in tune with my news, madam. Oh! Alas! A million times, alas! Have I brought bad news instead, dear lady? I thought the news were joyous! You have brought the news which you have brought. You can be blamed of nothing, old man. But why have your eyes darkened so much? Why the flood of tears? Because I must, old man, because I must. It was the will of the gods and it was accomplished by my own schemes. Have courage, my Lady. Your children will bring you back here again some day. My lady, you’re not the first woman who will miss her children. People must meet their ill luck with courage. Fine. Go now and prepare everything the children usually need during the day. Oh! But why, my darlings? Why look at me like this? Why… why give me a smile like that? As if it were your last? She takes the children by the hand and moves towards the door. Then suddenly stops. Turns, lets go of their hands and moves forward. I’ve often thought about things, perhaps more deeply than a woman should. I’ve pondered over an argument for a very long time, considering all of its subtle points. Not all of us, of course but enough of us to make one say justifiably that a woman’s mind is not totally without wisdom. This is because whilst the childless folk don’t know if children are a good thing or bad, they escape a great deal of concern and worry, whereas those who do have in their house these little blossoms, well, I see them worrying all day long about how to raise them properly and how to leave them a good inheritance. And after all that, one doesn’t know whether all this effort was made towards children who were worthy or unworthy. And at the end, of course, remains something else, worse then everything else. I’ve been watching anxiously for a while now to see how the matter has developed, ladies. Indicating into the distance. Ah, now I can see one of Jason’s men approaching. I can see by his flushed face that he’ll be announcing some new misfortune. Medea! Medea! What a gruesome crime you have committed! Why? Why should I leave? What have I done? The Princess and Creon, her father, are both dead by your own hand, by your own poisons! Woman, what are you saying? Have the news made you insane? You have just heard that the whole royal family has been murdered, yet you’re laughing. Are you not afraid? I, too have something to add to your words, messenger but don’t be in such a rush, my friend. Tell me exactly how they died. My joy will be twice as great if I hear that they died in the most terrible way possible. The moment your children and their father entered the wedding chambers, we, the servants felt an enormous joy, though we also felt sorrow enough for your misfortune. The word was spread around the palace rooms immediately that you two have abandoned your earlier squabbles and everyone kissed the hands and the blond heads of the children. In fact, I, out of sheer pleasure, forgot myself and followed them all the way into the women’s quarters. Suddenly though, the whole scene changed. It became awful, horrible to see. Now, they’re lying there, two corpses, a father and a daughter, side by side, a most hideous death, a death, worthy of the deepest grief. It’s obvious that the gods are delivering a great many woes to Jason today. And rightly so. But you, you, poor daughter of Creon! We grieve for your terrible suffering. A suffering caused because of your marriage to Jason. How quickly you’ve come before Hades’ gates! And you, too, wide and bright Light of Helios! They have sprung out of your own golden seed, Helios and it is a terrible thing for the mortals to spill the blood of immortals. Hold her back, immortal light! Stop her! How easily all the effort and all the years to have these children are to be wasted! Was it for nothing that you gave birth to these children? Was it for nothing that you once attacked the gruesome and dark clashing rocks? Why flood your soul with wild hatred that throws you into such hard murders? Murders of one’s own flesh and blood weigh heavily on mortals and huge curses are heaped upon the murderers. Screams and groans of agony from the boys within. Ah! Do you hear? Do you hear the children? I don’t know, my brother. We are doomed! Ahhhh! Shall I go into the house and save the boys? Miserable woman! Is your heart made of stone or steel? How can you murder the very children you bore? I know of only one woman, from the olden days, who used her own hand to kill her children. That was Ino. The gods had torn out her senses and Zeus’ wife sent her off to wonder aimlessly away from her house. Then the woman took her children and jumped into the ocean. A triple drowning. What can be more horrible? Such painful wedding beds! What endless suffering you bring to the mortals! It’s obvious! You’ve no knowledge of the misfortune you’ve suffered, Jason, otherwise your words would be different. Why, what happened? Tell me! Was she after me, as well? Medea has killed your children with her own hands! What are you saying, woman? Your words are tearing me apart! Consider your children dead, Jason! Where? Where has she killed them? Out here or inside the house? Open the door, Jason and you will see their dead bodies. And then, and then you have made yourself my wife, you gave birth to our children and then you have killed them, too! There are many words I could answer you with, Jason but our God, Zeus, knows how well I treated you and how I’ve suffered because of you. Did you think that having turned me into something to be ridiculed would make you a happy man? Did you think that I’d let you live and go on mocking me? No! Not even Creon himself, nor his Princess would be able to send me away without my first being able to avenge myself. But, you, too, ache and suffer from what you’ve done. True but my pains are eased knowing I’m not the object of your ridicule. My darling children! What a despicable woman gave birth to you! My darling children! What a despicable man gave you such a destruction! They were not murdered by my hand! No, what killed them was the shame and your new marriage. Was an empty bed a good enough reason for your murders? Do you think an empty bed is such a small thing for a woman? For a normal woman yes. But for you, obviously, everything is a catastrophe. Yet… look, they’re not alive! Oh, my darlings! How this cuts deep into my heart! They’re alive! And they will throw crushing curses upon your head! The gods know who is the primary cause of their destruction. And they know, too, your hateful soul. By all means, hate me. And I shall hate your sickening voice. And I yours… yet, we can both be easily saved. Saved? How? What would you have me do? I, too would love that. Let me bury the children. Let me bury them and grieve for them. But the Fury will punish you! The Fury and Justice will destroy you, for committing the murder of your own children. Which god or spirit will listen to you, Jason? You, who tells lies to foreigners and dishonours them? Go home, Jason. Go home and bury your wife. You’re still not grieving as you should. Wait till old age comes to you. They were darlings to their mother, not to you! Darlings, yes. But it was still you who killed them. Yes, for the sake of vengeance. In the name of the gods! Let me touch the soft body of my children! No, your words are in vain. Do you hear Zeus? Do you hear how she sends me away? Our Olympian Zeus is most wise! 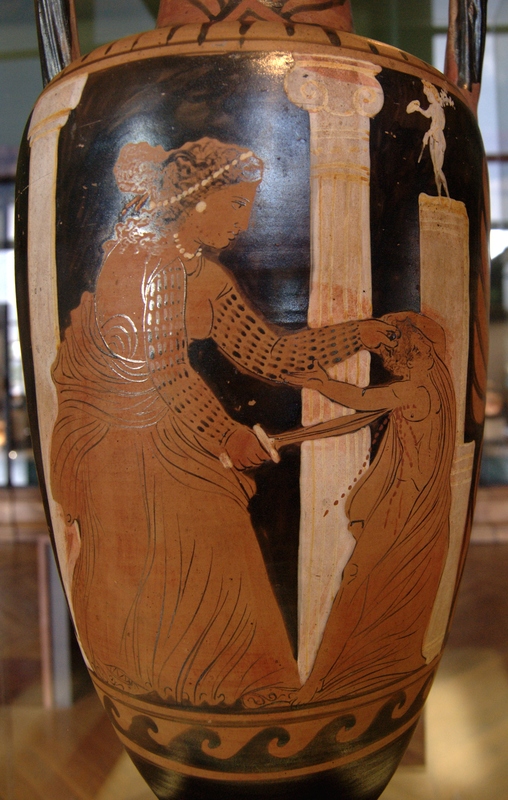 Medea killing her son. Louvre.